Is Goaltending Really a Problem in Dallas? While the goals against have once again piled up in the state of Texas, the Stars are doing what they could not do last season. The Dallas Stars were the West’s best offense last season but failed to qualify for the postseason in large part due to the performance of the defense and the poor play of Kari Lehtonen at times throughout the season. It certainly wasn’t all Lehtonen, as the back-ups in Dallas routinely failed to win games and post solid efforts. Jim Nill felt he needed to address the goaltending situation so he went out and added Antti Niemi in the offseason. Statistically and on the surface, it doesn’t look as though either goalie has performed well this season. It hasn’t quite been that simple. Both goaltenders have been given a pretty even shot this season with Lehtonen making 40 appearances to Niemi’s 45. They’ve certainly both had their ups and downs as we’ve seen them pitch shutouts one night and get pulled the next. When it comes to the Stars and goals against it is a very “when it rains, it pours” scenario. Dallas plays a risky style of game as it is and if they get down by a couple of goals, their game is almost exclusively risk. That is what brings us to the discussion of whether or not goaltending is really an issue for the Stars. Sure the statistics are not pretty and neither Niemi or Lehtonen will be winning a Vezina any time soon. That being said, they do a quality job for the situation they are put in on most nights. Are they really as bad as the statistics say or are their statistics the product of something bigger than either of them? While Dallas played awfully loose last season they have taken it to another level this season. At even strength they have already surpassed the amount of high-danger-chances against that they had last season. On average they give up an extra high-danger chance per game this season. That adds up and it has contributed to the statistics of both Niemi and Lehtonen. Lehtonen has had a brutal time with the high-danger chances. He has posted a .795 save-percentage on those types of shots at even strength, second-lowest in the NHL among goaltenders who have played at least 1000 minutes this season. Niemi has been much better in those situations, posting a .845 save-percentage. While that isn’t touching the top of the league, it does put him ahead of goaltenders like Tuukka Rask and Semyon Varlamov this season. No goaltender that has appeared in fewer games than Niemi has as many high-danger-saves as he does. Only four goaltenders who have played less than Lehtonen have more high-danger-saves as well. They face a lot of them and it can often cost them on the scoreboard. Remember, when it rains it pours, especially when those kinds of chances are showing up all of the time. Lehtonen has had six games this season in which he has given up at least four goals. Niemi has had eight. That is going to inflate the goals against average and deflate the save-percentage by a significant amount. One thing each of them has limited this season are goals from low-danger areas. If you are unfamiliar with the danger areas, this link via war-on-ice.com should help. Both Niemi’s and Lehtonen’s low-danger-save-percentage is middle-of-the-pack in the NHL and they are among goalies such as Corey Crawford, Jake Allen, Martin Jones and Cory Schneider with similar numbers. While each of them have had their issues at times, both Niemi and Lehtonen have done a better job at limiting the “bad goals” that plagued the Stars so often last season. Last season, Lindy Ruff consistently brought up the Stars not getting “that save” at the right time. That has changed this season and has allowed Dallas to stock up the victories. So many games were choked away and so many comebacks fell short due to untimely goals against last season. While Niemi has struggled as of late and Lehtonen has played incredibly well, that hasn’t always been the case this season. Until recently, Niemi was the “big-game” goaltender and really helped the Stars getting off to the fast start that they did. One thing he has been able to do well this season is lock games down when the Stars jump ahead. Niemi has posted a .933 save-percentage at even strength while the Stars are ahead this season, a number that puts him among the league-best in that scenario. Opponents coming back on the Stars has happened much less often this season in large part thanks to the play of Niemi with the lead. 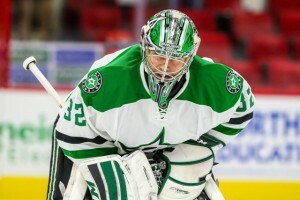 For Lehtonen, it has been either a great performance or an awful one, without much middle-ground. He has yet to lose in regulation this season when giving up two goals or less and he has achieved that feat 17 times this season. Many of Lehtonen’s losses have come in blowouts or when he hasn’t faced many shots. Even when Dallas limits overall shots, the ones they give up still tend to be quality scoring chances. Both goaltenders have been making important saves at key moments of games and that has allowed the Stars to get away with giving up quality chances. Could it Just Be the System? As long as the current system is in place, no goaltender that comes to play in Dallas is going to put up Vezina-quality numbers. Niemi has been a model of consistency over his career, posting between a .912 and a .924 save-percentage every season since he came into the league. This season he is putting up a .903. Did he really get that much worse in just one season? Highly unlikely and the risky style of play has to be considered when looking at these goaltenders. The Stars are a top-ten team in shots-against-per-game but are bottom-three in high-danger-chances-against. That combination is going to lead to some bad save percentages. There isn’t much of a way around it. While both goaltenders have had their share of goals that they’d like back, overall you can’t be too upset with their performance this season considering the circumstances. If you’re going to limit shots against but most of them are quality chances, you have to expect some rough-looking statistics. The wins are the numbers that matter for Lehtonen and Niemi this season. They’ve gotten plenty of those. They will look to prove the naysayers wrong in the postseason.